This is a German-French postcard: printed in Germany, mailed in France in 1905. Superb photography and quality (handpainted!) that the Germans were renown for during the Golden Age of Photography. 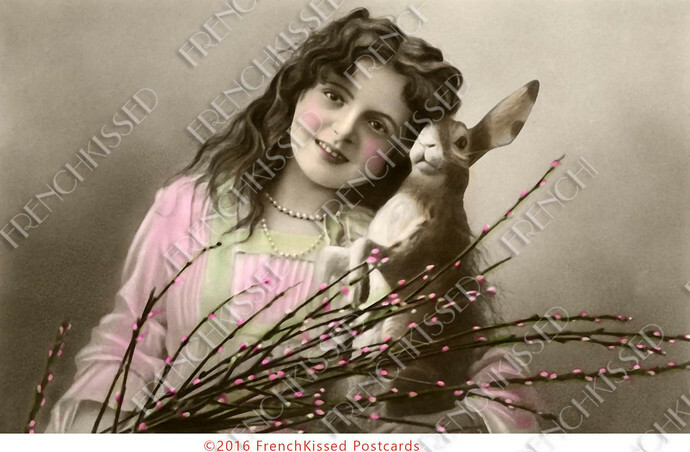 I realize Easter is several months away, but if you like this image, buy it now! I have the original postcard for sale in my other shop and when it's sold, I'll remove this listing, per my stance to only sell digis of cards I own. Embedded copyright. This scan is for COMMERCIAL use (commission and royalty-free). Use it as is or customize it and resell in PRINTED form. Personal use version also available; listed separately. Just WAIT about 3-5 minutes and you will receive an email with the download link for Photo No.1 about 5.5 by 3.5 inches at 300 dpi.